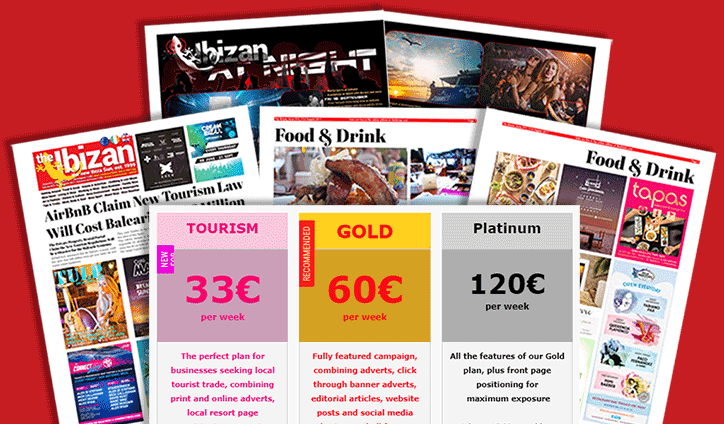 Our Ibiza advertising packages for the summer season offer better value and greater reach than ever before. Responding to the needs of our advertising clients, we now publish a special monthly tourist edition alongside the weekly newspaper. The tourist edition is DOUBLE THE SIZE of the weekly newspaper, with DOUBLE THE HOTEL & APARTMENT DISTRIBUTION. This special tourist edition includes FEATURE RESORT PAGES with local information and maps specifically designed to be popular with Ibiza’s summer tourists. We have also launched a new TOURISM PACKAGE, offering adverts on the resort pages, map pin locations, feature listing text and free agenda event listings, all for a heavily discounted 33€ per issue – putting promotion within the reach of all sizes of business. We continue to offer our most popular GOLD PLAN and the front page PLATINUM PLAN, both of which bundle print and online adverts, print and online editorial articles, social media sharing and much more, to offer a complete marketing package at a fraction of the cost if bought individually. A new feature at no extra charge, we offer 10,000 banner advert impressions and free agenda event listings. Bigger & Better Newspaper, Bigger & Better Circulation, Bigger & Better Online Reach, Bigger & Better Seasonal Plans, and not a price increase in sight. The perfect promotion to reach Ibiza´s tourists through our hotel distribution. Combining print and online adverts, local resort page positioning, map pin locations, feature text, free agenda event listings, and all for a realistic low price. Fully featured campaign, combining adverts, click through banner adverts, editorial articles, website posts and social media sharing, and all for one heavily discounted price. Flexible advertising in print and online with optional upgrades.